We love photographing parties in Los Angeles because we never know what we might see. The long hallway entrance to this party was fully draped in silver fabric, and featured numerous chandeliers. 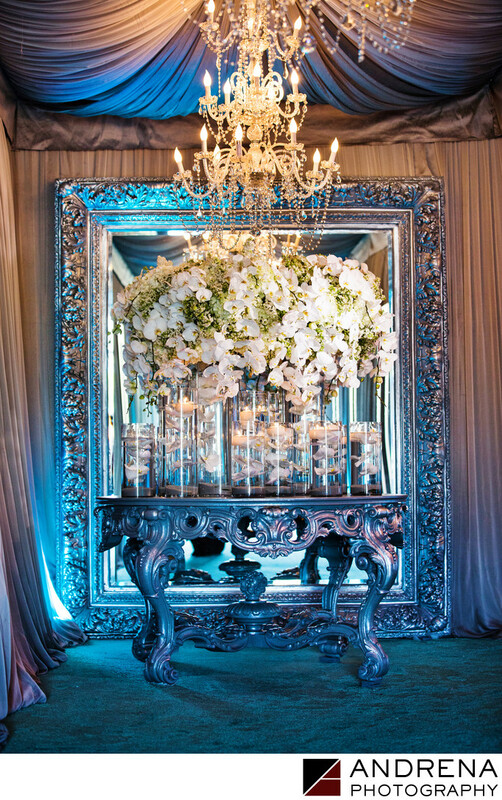 At the end of the hallway, this stunning oversized silver mirror was positioned behind a table full of candles and white flowers. The chandelier hanging just overhead added a sense of luxury just before guests turned right to walk into the Tiffany-themed event tent. This stunning floral arrangement was published in Grace Ormonde Wedding Style.